Mutant meat: will Australia deregulate genetically modified animals? Drafted through a collaborative process among civil society groups. 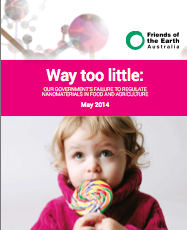 Our report, Way too little, looks at the now widespread presence of nanomaterials in our food chain and how little Food Standards Australia New Zealand (FSANZ) and other regulators are doing to ensure our safety. Australia has the highest rate of skin cancer in the world. Using sunscreen, along with protective clothing, a broad-brimmed hat, sunglasses and staying out of the sun in the middle of the day, is important to help reduce the risk of developing skin cancer. However, Friends of the Earth is concerned that some nano-ingredients in sunscreens may be doing more harm than good.